The Adams Ranch is in the Willow Creek region on the west side of Paso Robles and rests on a plateau with the Santa Lucia Mountains as a backdrop, with a steep drop to Vineyard Drive in the foreground. The vineyard is almost entirely Syrah, with some Grenache and Mourvedre peppered in. They expand every year at a snail’s pace, with 25 dry farmed acres as the ultimate goal. The vines are own rooted and reared in the home nursery after pruning each year. Once established, the vines are dry farmed, field-blended and co-fermented using only native yeasts and are aged in neutral oak barrels. The winery’s site and mailing list sign up is available by clicking here. If desired, you can order wine directly from the winery or just check out their current releases by clicking here. Mark is mister do-it-all, farmer, winemaker, musician, husband, father and formerly a sound effects editor for Sony. Mark is also the assistant winemaker for the renowned Saxum Winery with his childhood pal, Justin Smith. Much more information about Mark, both wine/beer and music related is available here. I highly recommend giving a listen to some of Mark’s music available on this site. 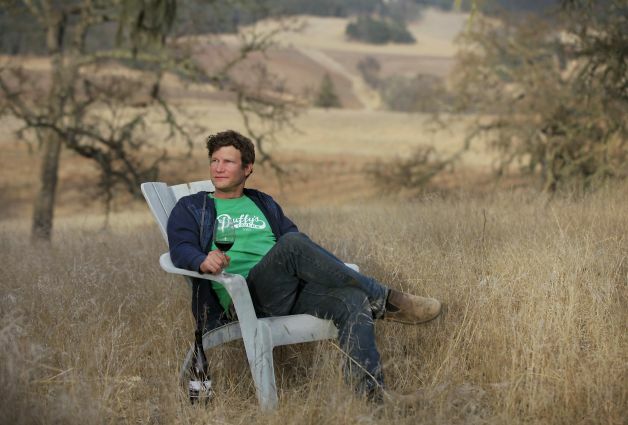 There is an outstanding over view of Mark on the San Francisco Chronicle’s site in a story titled “Winemakers to Watch 2014: Mixing tradition and pioneering spirit by Jon Bonné. The story is available here. I received several bottles of wines to sample. There were three different “labels”, California Soul (Mother Hips), Catacombs and Kazoo. The first two labels included a white, a red and a rosé each. Instead of trying to sample all seven wines at once I had to choose between sampling based on label or style. I opted to sample the wines by style. A couple weeks ago, I posted my write up of rosé wines. This post will cover the Red wines. A later post will cover the whites. 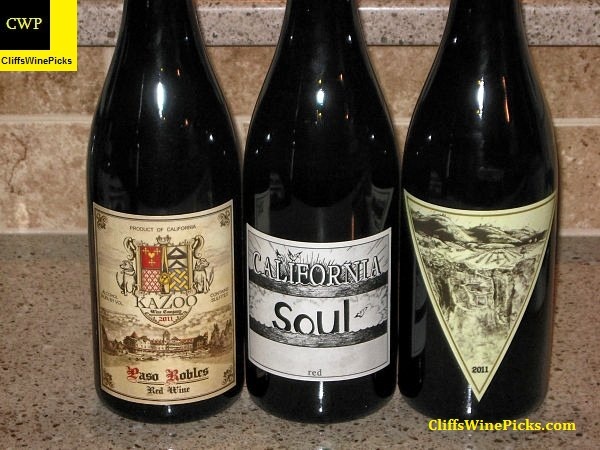 These wines may be available at your local wine store; I know my local store carries both of these wines. We created this label as a fun, gentle poke at pretentious wine labels. It features the Historical Paso Robles Inn (pre fire) as a French chateau, with our dogs (Sid Vicious and Lucinda Williams) as gargoyles next to a coat of arms. 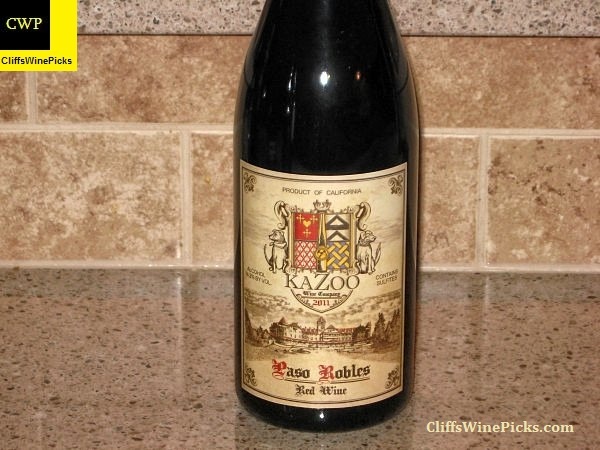 The wine is proudly labeled “PRODUCT OF CALIFORNIA” and features a golden Kazoo at the center of the coat of arms. We are experimenting with style here, producing first a blend of Syrah and Merlot, and followed up by a 100% Carignane, neither of which are common blends. This wine is a blend of Merlot 50% and Syrah 50%. The sometimes vegetal Bordeaux characteristics of the Merlot are present in the nose of this wine but are softened and lifted by the Syrah. They play really nicely together and at only 14.2% alcohol, this wine shows great weight and complexity without the flab. This was aged 20 months in new and neutral French oak. This has 14.2% alcohol by volume and the bottle is sealed with a natural cork. The Mother Hips is a rock band that is known for a style of west coast music that came to be referred to as California Soul. 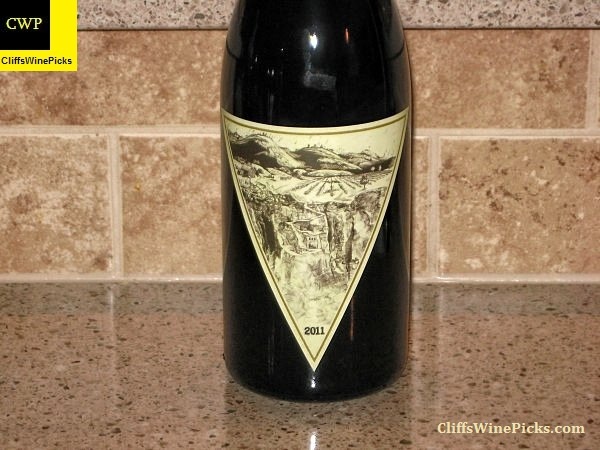 Upon their 20th anniversary, Ledge paid tribute to them by blending 60 cases of wine, which to our surprise sold out in a few weeks. This was never intended to be a “lasting” label, but the brand and the wines continue to attract new fans every day. They expanded the line to include white and rose wines in addition to the red blends. This wine is a blend of Tempranillo 45%, Zinfandel 30%, Syrah 20% and Cinsault 5%. This was aged 18 months in new and neutral French oak. Tempranillo performs remarkably well in Paso Robles, it reaches optimum ripeness and is extremely fruit forward compared to most Spanish Tempranillo wines. This was blended at the same time we blended Catacombs, only this wine was never intended to contain Syrah. The syrah added some tannin and spice that cut through the lusciousness of the Zin and gives the wine extra length and complexity. The concept of Ledge Catacombs is simply that it is farmed in close proximity to the family estate. The vines are sustainably farmed and offer us some insight with regard to our planting decisions at the Adams Ranch. 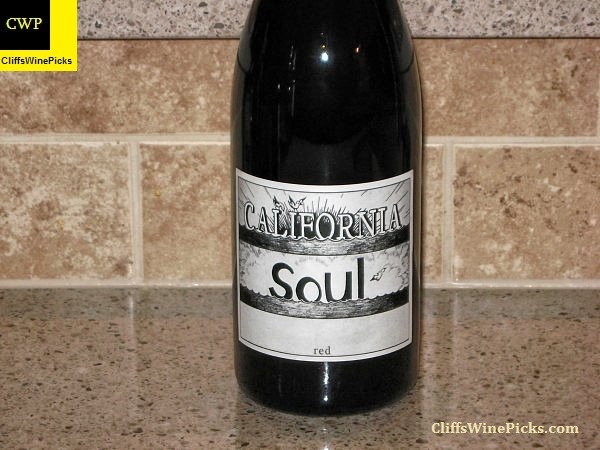 This wine is a blend of Grenache 40%, Syrah 30%, Mourvedre 20%, Counoise 7% and Zinfandel 3%. This wine was aged 18 months in new and neutral French oak. This is primarily Grenache, and weighs in at 15.5% alcohol. This was initially drawn up as a Rhone-only blend, but test blends finally led to the inclusion of a small percentage of Zinfandel, which ties the whole room together. This one drinks well into day three of being opened. This has 15.5% alcohol by volume and the bottle is sealed with a natural cork.